Q: How many zombies does it take to ruin a social life? Megan Berry is a Settler, meaning that she helps the dead to find peace in the afterlife by giving them one last outlet for whatever they left undone in life. It's sort of like a medium, except instead of ghosts she's dealing with zombies who will kill her if she doesn't help them. As if that's not scary enough, Megan thought this was all behind her, and her powers would never fully manifest. So when a zombie shows up on the night of her big date with the most popular boy in school, she's a little upset. She soon realizes that her zombie problems aren't just from her powers awakening - someone's out to get her . . . maybe even get her out of the way forever. If she's going to survive til the Homecoming dance, she's going to need to take a long hard look at everyone around her. This was yet another cute story from Stacey Jay! I loved the unique angle on the zombie genre with the concept of Settlers. It was refreshing to see another author besides Daniel Waters give some actual intelligence and humanity to zombies. I've been waiting for this trend since vampires and shifters both became sympathetic characters in the paranormal romance genre, but it's only just recently starting to catch on. The rating would have been in the solid A- range had it not been for the whole bit with Ethan and Monica. Sure, I could see where it was going. But not only did it frustrate me as a reader to see Megan so upset, it was also frustrating to get so attached to Ethan as a character and then suddenly only hear about him in internal dialogue. I really enjoyed his character and wish that we could have spent more time with him in the last half of the book. Anyway, Stacey Jay has a whole bunch of great books! 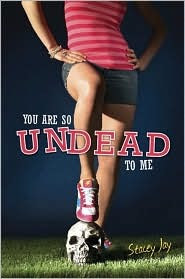 If zombies don't appeal to you, you should check out The Locket and Juliet Immortal.